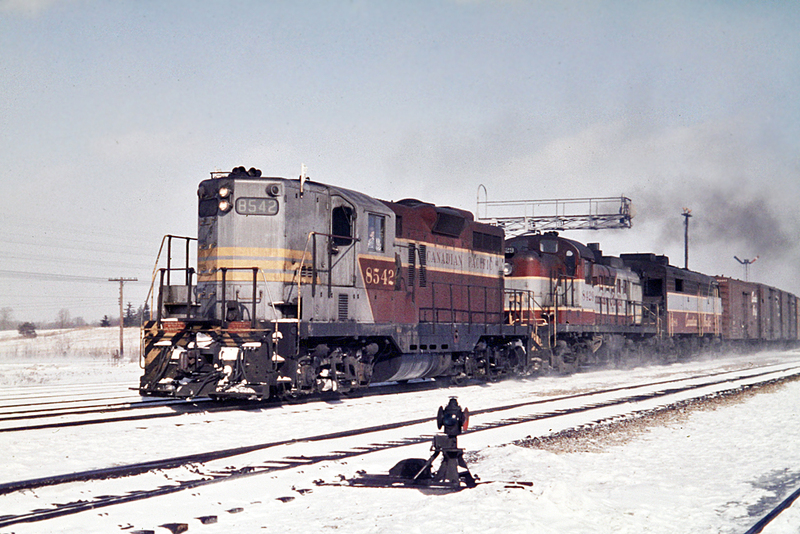 Railpictures.ca - Dave Burroughs Photo: Another classic hodge-podge of CP power at Guelph Jct. The nice thing is that all units are painted in gray and maroon. The 8542 is even sporting the block lettering which preceded the script lettering as on RS-3 8429 and MLW FA-2 4084 ?? | Railpictures.ca – Canadian Railway Photography – photographie ferroviaire Canadienne. Caption: Another classic hodge-podge of CP power at Guelph Jct. The nice thing is that all units are painted in gray and maroon. The 8542 is even sporting the block lettering which preceded the script lettering as on RS-3 8429 and MLW FA-2 4084 ? ?